The ECOFLEX underfloor heating cable or 'loose wire' kit provides an underfloor heating solution for warm floor tiles in your kitchen, bathroom or conservatory. The cables are flexible and perfect for smaller installations or areas with an irregular shape. 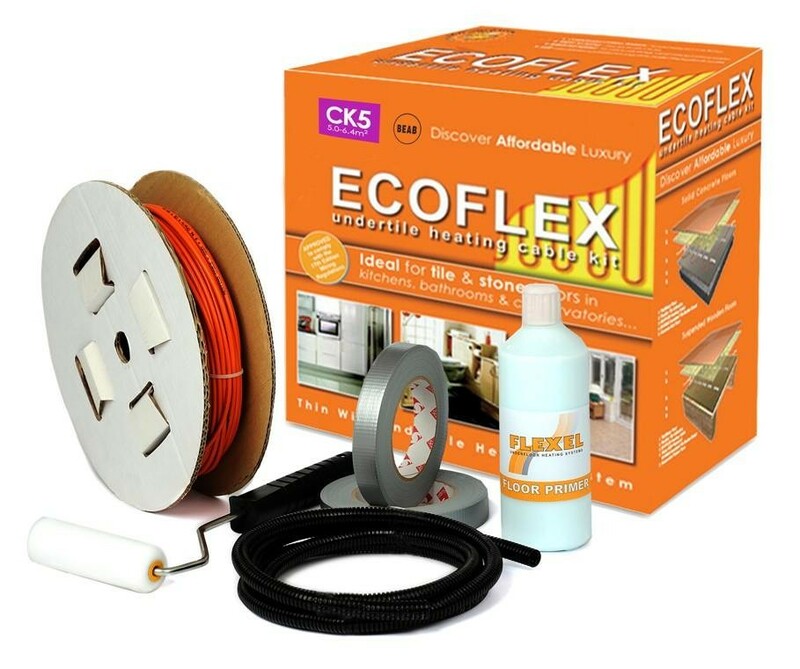 The ECOFLEX kit includes instructions, heating cable, adhesive tape, floor primer and roller, thermostat conduit and guarantee. This kit does not include a thermostat. You will need at least one thermostat in addition to this kit. BEAB approved heating element. Ensuring the highest of safety standards. Twin conductor ultra flexible cable simplifies installation with only a single "cold-tail" connection. Two extremely tough, durable insulation layers which minimises the risk of damage during the installation process and ensures prolonged cable life. Suitable for all ceramic, porcelain and natural stone. On concrete floors, to further enhance efficiency it is highly recommended that you use an insulation (backer) board under the heating wire. This ensures most of the heat travels up through your tiles and not down into the floor.